Welcome, my friends, to the Let Your Geek Sideshow Interplanetary Travel Exchange! Tired of visiting the same old tourist traps in your old family jalopy every year? Endlessly long lines at your favorite amusement park got you aching to try something new? Wish you could still hit the slopes in the off-season without all that pesky global warming ruining your fun? Then Hoth is just the place for you! At a crisp -60 degrees Celsius, this beautiful remote planet is covered in snow and ice all year round and has ski slopes that would put Aspen or Salzburg to shame. Even if skiing isn’t the main goal of your visit, there is still plenty to do. Tauntaun rides, for example, are fun for the whole family! Just be sure to get back to your hotel before nightfall. Brrrr! Now, I know what you’re thinking. 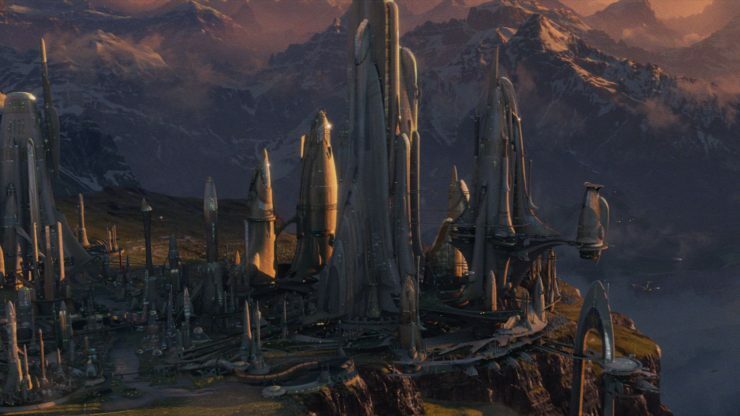 What about that pesky intergalactic civil war? 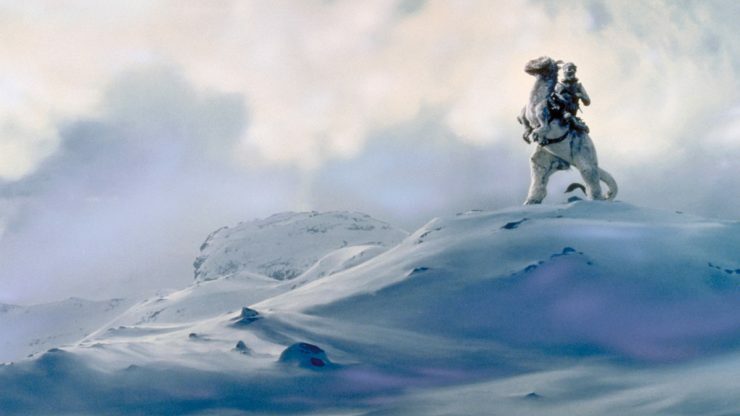 Well, fear not friends, because Hoth is located on the Outer Rim so the odds of the war coming anywhere near this spectacular snow-covered landscape are about 3,720 to 1. … Sorry, one sec, I’m getting a call in my headset with some new information … Hello? … Yes, I’m just telling them about it now… Really? All flights are canceled?… Wow… To bits, you say? … All of it? … Okay well… thanks for the info. Sorry about that. Ummm… you know what? Alderaan isn’t really for you. Not your style. Trust me, I have a knack for these things. What you need is… the opposite kind of planet. Now, this is the place for you. Just look at those gorgeous dune seas extending for miles in every direction. And the weather is amazing. It never rains, it never snows. Just sun, sun, sun all the time! 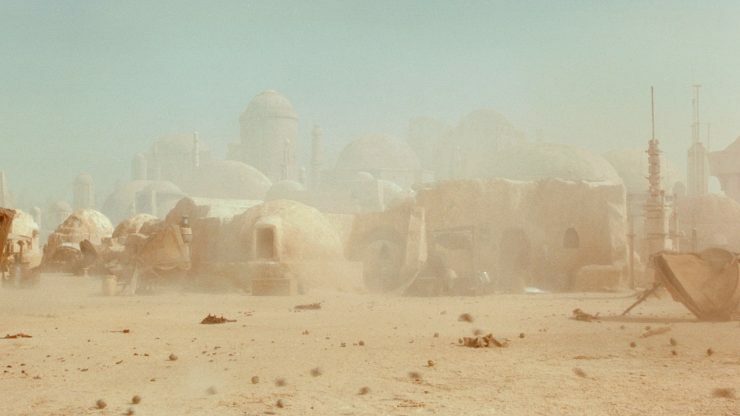 In fact, Tatooine orbits two suns for double the fun. If you want to get the type of tan that will make the people back on Earth jealous, you’ll never get better ultraviolet rays than on this desert planet. Sure, it’s hot, but it’s a dry heat. You’ll get used it pretty quickly. Plus, maybe you’ll win some money on those pod races, eh? And the nightlife, forget about it. You can catch the very best tunes in all the galaxy at the Mos Eisley Spaceport cantina, and I hear Jabba the Hutt’s palace just signed the Max Rebo band to a lifetime contract! I bet people are just dying to get down on that dance floor. So what do you think? Where are you going? I’ve got plenty of other planets to try and sell you on! How about Kamino? Or Mustafar? Can’t go wrong with perfect perpetual hurricanes or large lakes of liquid lava, am I right? *Let Your Geek Sideshow is not responsible for any unforeseen consequences as a result of traveling to these vacation destinations. This includes, but is not limited to, Wampa attacks, being covered in smelly animal entrails, falling through trap doors, hungry Rancors, total planetary destruction, or sand… It’s coarse and it just gets everywhere. Ugh, we hate sand so much. Geek Headlines- How To Train Your Dragon 3, GLOW Season 2, Riverdale, and More! Geek Headlines- Deadpool 2, Deadly Class, Jurassic World: Fallen Kingdom, and More!